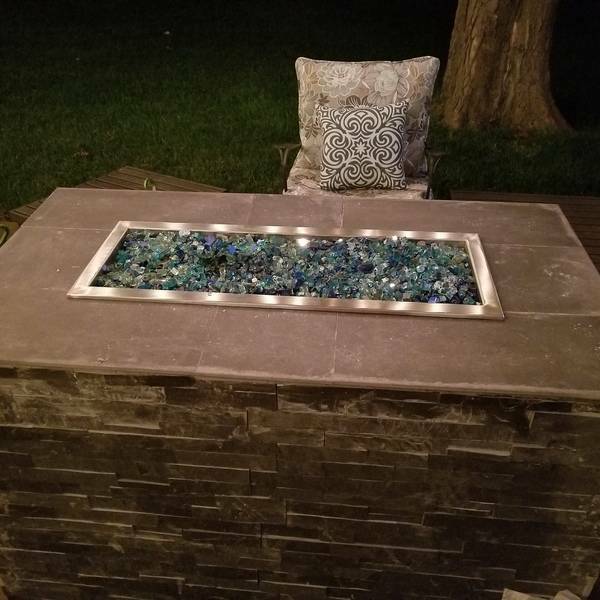 This simple box design wrapped in ledger tile and topped with beautiful fire glass creates the backyard escape that you will enjoy on long summer nights, and cool fall evenings! 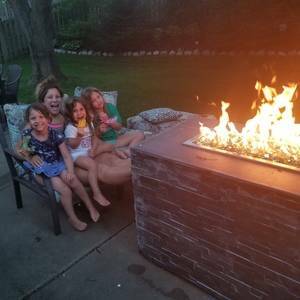 A beautiful backyard addition! Great work on this piece! Thanks RN--- this definitely is one of those "high impact" show pieces! Did you buy a pre-mix of glass rocks to get that color blend? Hey Dan -- great question. I played around with different looks until i got the blend i liked. I bought mixes off amazon and walmart. I went for some as the bigger 1/4 inch size mixed with smaller pieces. I also bought some that were reflective, so they would cath the sun during the day, and glow with the fire at night! 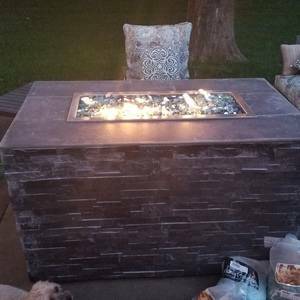 I like the look of the stacked stone blended into the smooth top.. Also--- That beast looks really sturdy, but heavy too-- have you thought about how you are going to move it when you need to? I was wondering the same?! the pictures make it look like it is floating? under the frame i attached 4 2" casters that are slightly recessed. I knew i would wan to be able to move it around when cleaning off the patio, but not have this thing sitting on huge wheels looking unnatural. 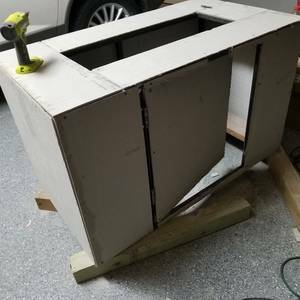 Did you use metal screws or the regular hardie backer screws to attach the board to the frame? Hey there L2B! What i did was use clamps to hold the hardie in place. Then pre-drilled with high speed titanium metal bits. Then came behind it with the self tapping star screws that you would normally use to attach the hardie to. Looks fantastic! 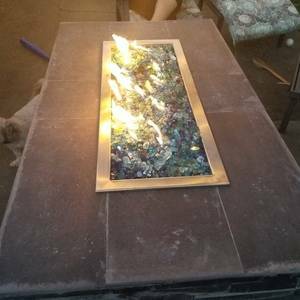 I was looking to make something like this and I found that the burners were very expensive. Where did you purchase yours? 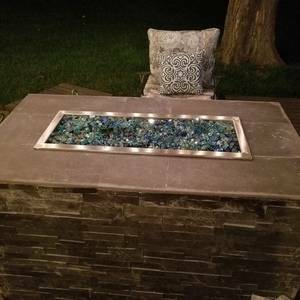 The "H" burner blends well and covers a nice area. You can probably get it cheaper, but this has worked well, and hasn't showed signs of rust despite leaving it uncovered in the rain. Thank you! That's exactly what I need. good luck and if I can be of any help, do not hesitate to let me know! What did you use as a frame to mount the hardiebacker? Is that wood or is it metal? Hey Kirks, This was something i was going back and forth on upfront. 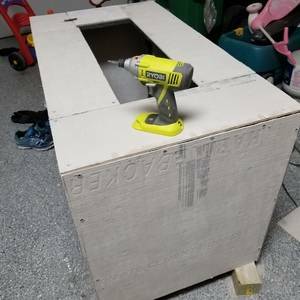 In my head i knew i could knock out a simple box frame using something like 2x2's or 2x4's. Then though about wrapping it in some fireproof insulation to deal with the heat, etc..
What are the dimensions? I was looking at some in stores, but they all seemed really low, especially for the little ones around our house. I ran into the same issue-- which is ultimately why i built one of my own. I decided to build it a little taller than standard fire pits you would see ad Home Depot. This way kids aren't always pulling the glass out. I also chose not to give it a long shelf on top, so my little ones don't smack their heads into it. 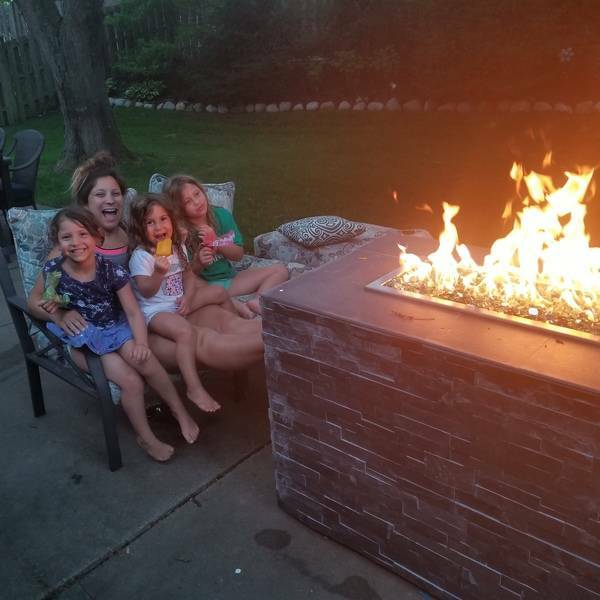 Actual Dims: L48" x W26" x H29"
hi dwizeman, really nice job on the fire pit. I have been weighing buying one at the store, vs building my own. I think this tipped the scales towards me building it. Great job!